Join Us!!! We are looking for someone to help us cover Madagascar basketball. Please send us an e-mail. Mb2all Analamanga celebrate 2018 title beating SBC (Boeny) 63-58. 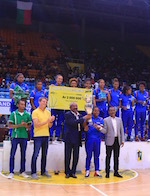 JAOFERA CHRISTIANE and Mampionona Miora top-scored for the winners with 14 points each. Mampionona Miora was named MVP of the tournament. Noella Mamihajarison brought 11 and collected 10 rebounds in the winning side. Fanja Raholiarisoa and RANDRIATAHIANA SAROBIDY answered with 14 points each in a loss. SOAZARA MARCELLINE scored 10 and SAMBATRARIMIORA TOKIN'IAINA poured in 9. MB2ALL closed the Regular Season with the win over Fandrefiala 62-58. MIORASOA MAMPIONONA top-scored for the winners with 21 points and CHRISTIANE JAOFERA nailed 12. BRIGITTE RAMANAMPAMONJY replied with 22 points in defeat and JUDITH FENOARISOA notched 15. JSB Boeny meanwhile edged Atsimo Andrefana 80-78. DOUDICUS ZANAMASY nailed 42 points for the winners and PRISCA RAVELOARISOA brought 23. LAURINE RAVAOMARIA delivered 34 points in the losing effort. MB2ALL won Coupe Du President 2018 as they edged SBBC (Boeny) in the Final game. MB2ALL looked better in the majority of the game for the final 62-49 win. 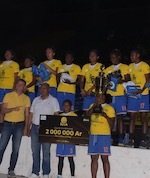 Muriel Hajanirina (175-G/F-98) from (MB2ALL Analamanga) was named MVP. Earlier in the semifinals MB2ALL beat TAMIFA 71-53. SBBC (Boeny) overcame FANDREFIALA 55-52.